Chrissy Teigen, a woman constantly after our own hearts, always makes us laugh, cry, and generally just say, “OMG I love you!” Basically, she’s the best. And you know what else is the best? Disney, duh! So, when we saw this photo of Chrissy and the super cute (and sadly very sold out) Disney x Coach Mickey kisslock bag arm-in-arm we were like *heart eyes forever*. Clearly, Teigen could not contain her joy either. 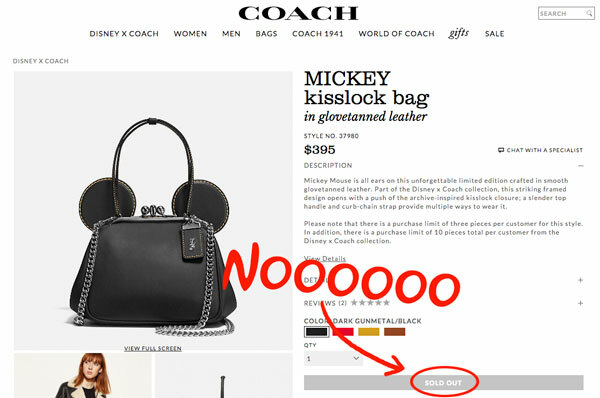 As you may know, other celebs have been spotted around town with the adorable Mickey line from Coach. Here’s Chloe Grace Moretz with the same kisslock bag. And Emma Roberts was a fan of the Mickey saddle bag 23. But, unfortunately, for the rest of us, the Mickey kisslock bag has sold out (although the saddlebag is still available!). So, save your pennies, because with the success of this collaboration who knows what other magical accessories will arrive from these two in the future!